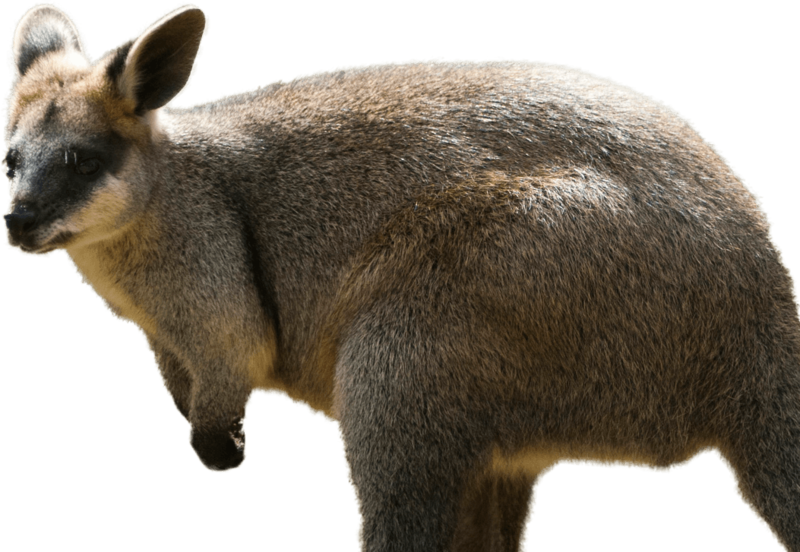 The Northern Swamp Wallaby is a solitary, nocturnal animal. Whilst it prefers wet or dry sclerophyll forests, it can be found in rainforests, woodland, open eucalyptus forests and heathland. The northern swamp wallaby relies on thick grass and dense bush to shelter and hide under during the day, coming out at dusk to browse and graze on grass and small shrubs. Although they are mostly solitary, they have been found to gather at common food sources during the night. Males can grow up to about 76 cm in height and weigh around 17kg. Females weigh 13kg and can grow to about 69cm. Distinguished from other wallabies by its dark colour, the northern swamp wallaby is classified as the only living member of the genus Wallabia. It’s unique gait, reproductive behaviour and distinct number of chromosomes further distinguish it from other wallabies. Most wallabies have 16 chromosomes. Female swamp wallabies have 11 while males only have 10. Northern Swamp Wallabies are strictly herbivorous, readily switching from one plant species to another. They are browsers and use their reduced forelimbs to manipulate food. Their diet is varied, consisting of soft plants such as buds, ferns, leaves, shrubs and grasses. They have been known to eat bark, shoots from needle-leaf trees, and plants that can be poisonous to domesticated animals and people. This flexibility means that they have become pests to agricultural crops and as a result, they are often shot by farmers.